Kicking off the UFC on FOX 18 main card from the Prudential Center in Newark, New Jersey was a welterweight clash between Bryan Barberena and Sage Northcutt. It’s Sage’s 170-pound debut, and he looks even more freakishly huge than usual. Interesting take on the first fight of the evening’s main card, as the hype seems a little toned down, maybe it’s just me. Round 1: After some feeling out Sage shoots for the takedown but gets stuffed, they take the centre of the octagon and trade kicks, Northcutt wings a kick, hits air, but he drops Barberena with a nice straight right. They clinch again, BB in charge against the fence, but Sage lands a deep double and takes the back but Barberena escapes. More clinching and Sage lands two punches on the break. He drops BB as he rushes in, but he’s not that hurt. Barberena cut on the forehead. ‘Bam Bam’ getting controlled now in the head fighting, nice knee to the gut by Northcutt. Takedown stuffed and now one scored by Barberena. Sage on his back but he kicks out and they trade. Sage rocked with a very nice right hand to the eye, and they swing for the fences. Close round, with the takedown it’s anyone’s. Round 2: Sage moving on his toes, Joe Rogan says he noticed Northcutt looks a little tired, Sage misses a kick and ‘Bam Bam’ takes him down. Nice GnP from Barberena, elbows to the head and Northcutt throws up his guard but just keeps eating elbows. BB to half guard, nearly in side control here, this is not where Sage wants to be. Big elbow hurts Northcutt now as he’s been down for a while, another stern elbow to the chops and Sage looks a little lost here. BB goes for the arm triangle, and it’s over! Northcutt taps to Barberena who took the fight on just weeks notice! WOW! 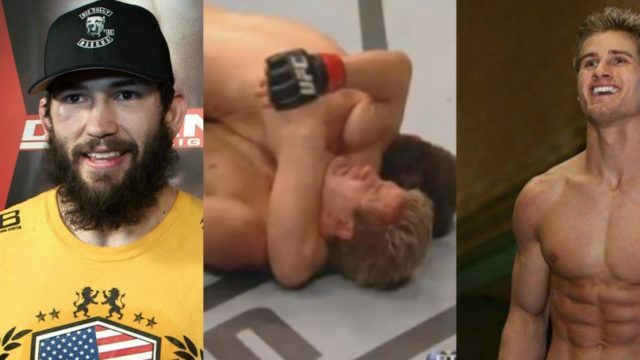 First round submission fr Bryan Barberena!